I discovered shibori completely by accident. I was browsing a department store and saw a fun shirt with a really interesting pattern and was told that the method used was probably shibori. So I did some searching and found that it's an ancient Japanese resist method that basically involves scrunching, twisting, folding and/or mashing a fabric and then dying it. 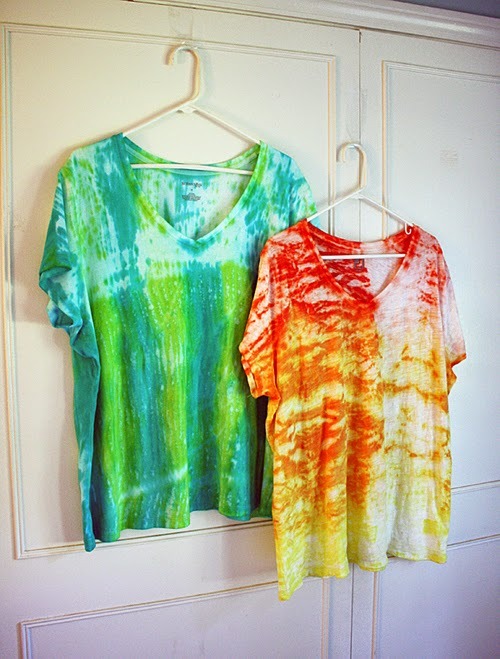 There are several ways to do it and the results, as with any tie dye, are different every time. One shibori method is to wrap fabric around a cylindrical object. For this particular design my pipe was 4-inches in diameter, a pretty big tube. The amount of resist on your tee will depend on how many times the garment wraps around the tube as the fabric that's touching the tube will receive less dye than the fabric that's on the outside. I'll also show you a design using a smaller tube at the end of this tutorial. Note: The PVC pipe I used cost me less than $10 and I can use it over and over again. Place your tee face down on the table. 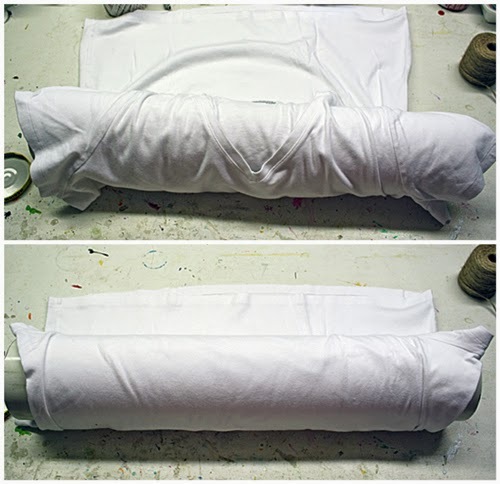 Place the PVC pipe at the top of your shirt and roll the shirt around the pipe so that the neckline disappears inside. The final fabric to wrap should be the bottom of the tee. Place a rubber band around each end of the pipe/tee and one in the middle. This is not for resist purposes, it's just to help hold the garment in place. Tie the twine to one end of the pipe/tee. 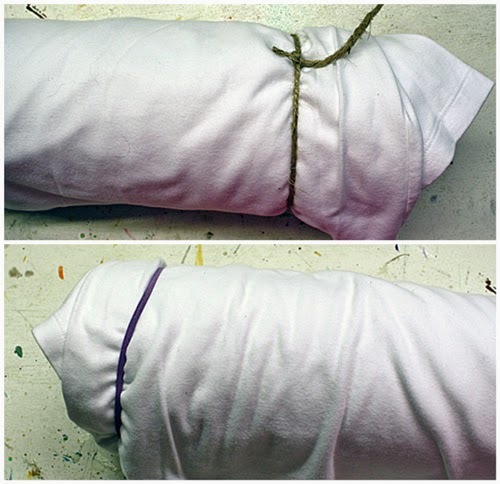 Wrap the twine all the way around the shirt and tie off at the end. Scrunch the tee as much as you can, pushing as much of the tee toward the center of the pipe as you can. Because the twine is tight, this can be a bit challenging, so another option is to scrunch the shirt first and then wrap (which I will demonstrate in the tutorial for the yellow shirt at the end of this post). Just be sure that the twine is tight. Mist the shirt with water in a spray bottle and dab with a towel. You want the shirt damp, not dripping. Mix the Teal and Lime dyes (add water and shake). Begin with teal, squeezing some dye onto the end of the tee, then skipping an inch or so, dying again, skipping, dyeing, until you reach the end of the tee. Fill in the white gaps with the lime dye. Wrap the pipe/tee in plastic wrap to hold in the moisture and allow it to sit for 6 hours. Run the pipe under cool water to remove much of the dye. Carefully cut away the rubber bands and the end of the twine. Unwrap the twine and rinse tee completely. Follow instructions on the package for laundering. As you can see, the neckline of the tee resisted more of the dye than the bottom half of the tee. The neckline was rolled inside first, so there were more layers on top of the neckline and the bottom half of the tee remained on the outside of the pipe. I love the way both of these came out! Would you like to know how I made the other one? 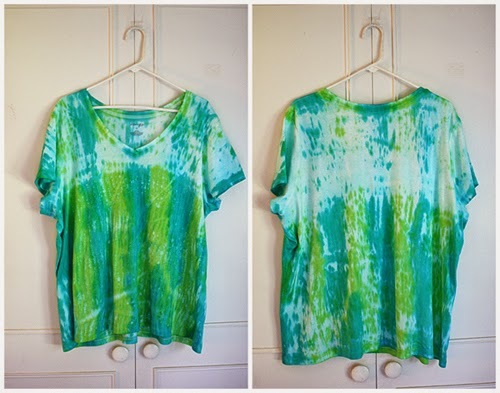 Head over to my tutorial for this Sunshine Ombre Shibori Tie Dye Top on my blog. Project created by Amanda Formaro for I Love to Create. Amanda is a well-known craft expert and author of the books "Rubber Band Mania" and "Duct Tape Mania", the first two in a series of craft books for kids. She has been writing and crafting on the Internet for over fifteen years. Find out more on her blog, Crafts by Amanda, where she shares tutorials with step-by-step photos for adults and kids alike. Thanks, so glad you like it! Have fun! Really appreciate that Lisa, thank you! I love tie dye! It just so happens that I was looking at the kits at Walmart and wondering how hard they would be! Your crafty post gave me a place to start in my mind! Thanks! I'm glad I recently found your site and signed up!!! Just found your website. It is great to learn more on DIY! Love tie-dye. The clothes are just amazing, i have to agree with you on the fact that you love to create. What you have created is perfect, and for sure you can do wonders. What astonishes me the more is the way all the colors appear on a cloth. Its just amazing. والاوبئة والفيروسات والتي دائما نريد الابتعاد عنها ,كما ان الانسان كلما كان نظيفا فهذا يدل على وضعه ومكانته والبيئة المتواجد بها والنظافة في كل بلد وكل مدينة وكل دوله هي المنظر الحضاري الجميل الزي يأخز عنها . That T-shirt is gorgeous!!! Love the colour. Wow! Can I know if this is natural indigo dye? I Think Lots of technique and pattern to tie and dye but i like the most this pattern. When i talk about our India tie and dye called bandhni bandhej.